Posted on October 17, 2015 by MD Posted in News . 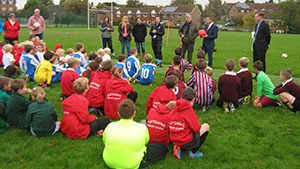 Chailey School are the first Network School to kick off the Peace Fields Project (PFP) Tournaments. Assistant Head, Tim Dudgeon, led the way for network schools participating in the PFP, commemorating the First World War and celebrating peace through play. The event will be followed-up with the school receiving a plaque next year twinning Chailey School playing fields with Flanders Peace Fields, Messines, Belgium, site of the First World War Christmas Truces. Assistant Head Teacher, Tim Dudgeon, introduces guest speaker Ernie Brennan from the National Children’s Football Alliance. Belgium (site of the 1914 Christmas Truce). 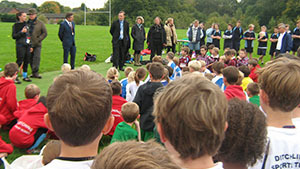 The nation-wide Peace Field Project has invited schools not only to commemorate World War One and the Christmas Truce but also to celebrate peace through reflecting on a moment in history that inspires humanitarianism, and Chailey School is proud to be at the forefront of this and one of the first schools to be involved. The afternoon, organized by Chailey’s Ms Davey, and refereed and run by the school’s Year 9 Junior Sports Leaders, saw some great football being played in a sporting spirit. In the end, Ditchling won the Year 3 and 4 competition (Wivelsfield and Fletching the Fair Play Award) and Hamsey the Year 5 and 6 (with Plumpton and Hamsey winning the award for Fair Play at that level). Posted on October 9, 2015 by MD Posted in International . 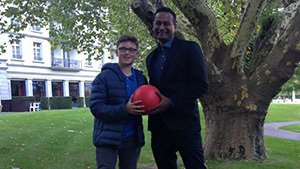 Abhijeet Barse (right) presents a Peace Poppy Ball to Claudia Doron’s (River of Hope, CEO) son for the Republic of Congo’s Peace Fields Project. The One World Play Project Peace Ball was presented outside the FIM International Conference. Abhijeet Barse, CEO, Slum Soccer, represented the International Children’s Football Alliance at Football Is More’s International Forum, Bad Ragaz, Switzerland. Abhijeet presented the International Peace Fields Project to an invited audience many of whom were custodians of football in their respective countries. Slum Soccer exists to foster sustainable development within otherwise marginalised populations of India. Abhijeet, says, ‘we aim to provide long term solutions to combat rife homelessness and improve living standards within underprivileged areas. Our approaches are centred on building self-sufficient communities. The game of Football is our means to that end- connecting individuals, teaching life skills and working towards improving overall quality of life. 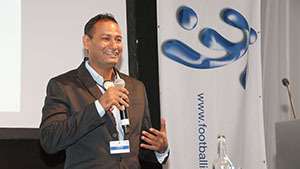 Abhijeet Barse presents the International Children’s Football Alliance’s Peace Fields Projects at Football Is More’s International Forum in Bad Ragaz, Switzerland. The Peace Fields Projects will enable Slum Soccer coaches, participants and volunteers, to establish peace pitches across India. The PFP will educate young and older people the value of sports at all levels. Remembering the soldiers of the First World War is important way to contextualize a part of history that defines humanity in everyday life. The Christmas Truces of 1914 are acts of human kindness and the stories lend themselves to everyday people from all cultures and backgrounds. We are looking forward to launching a Children’s Football Alliance (CFA) in India. Slum Soccer invites child focused agencies across India and the world to support the formation of an Indian CFA which through sharing best practice we will be in a stronger position to deliver funded projects to communities in need.